The term 网络强国 (wǎngluò qiángguó, hereafter WLQG) first became prominent in early 2014 around the time of the first meeting of the new Central Leading Group for Cybersecurity and Informatization, headed by Xi Jinping. Since then, the phrase has become a unifying slogan around which a host of national and local policies on cyberspace and digital technology are discussed. The term and related strategic thinking are widely attributed to Xi, who has repeatedly referenced it, including in his landmark April 19, 2016, speech to the Work Conference for Cybersecurity and Informatization and a follow-up speech two years later. It was even featured in a rousing patriotic song, available in video (lyrics). The role of this slogan in policymaking and political rhetoric spans a wide terrain, and the connotations it takes on in different circumstances similarly vary. It is thus both difficult to capture in a single translation and important to understand as a unifying rhetorical tool in differing areas. This long history of usage in a variety of fields suggests that the term qiángguó can be read in a number of different ways. It can be understood as a slogan first and foremost, as a desired end-state of strength in a given area, or as a process of strengthening. In reality, many of these formulations take on different grammatical and rhetorical roles in different contexts. The logic of short phrases in Chinese allows and guarantees some flexibility in reading. In recent years, both the phrase WLQG and the array of policies and ambitions connected to it have gained special prominence. For the Party, securing a more independent information technology base is viewed as crucial for stability and survival, and it serves as a foundational initiative in an effort to achieve leading status in a broader array of technologies. The ICT world is under the most intense focus for now, but over the longue durée Chinese officials aim to build their country into a world leader across multiple axes of technological development and construct a Chinese technological ecosystem that embeds most forms of technological development. Indigenous innovation and other priorities linked to WLQG could also fuel a transition toward knowledge-driven industries and help solve issues of food security and environmental degradation—areas that strongly influence Party legitimacy. DigiChina has in general translated WLQG as “cyber superpower.” Here, we discuss some of that translation’s strengths and weaknesses, and compare it with other candidates. The case for “cyber superpower.” Translating WLQG as “cyber superpower” has several virtues compared with the other concise translations of the four-character phrase. Centrally, it captures an almost grandiose level of ambition attached to Chinese government and Communist Party plans and development in cyberspace fields. It specifically carries the connotation, implicit in many uses of the phrase, that a WLQG is a rare thing, and that only the United States is one today. Taken as a whole, the United States, the original home of the Internet and current home of important global companies and innovation, has exceptional leverage in cyberspace. Taken as a whole, China’s WLQG rhetoric and strategy focus on giving Chinese government and private sector actors a much higher degree of autonomy and influence in the daily life of global cyberspace. In this sense, the Cold War connotation of “superpower,” in which two actors outweighed all others on the global scene, is fitting. The case against “cyber superpower.” Adopting the term “superpower” here does have its downsides. For one, there is a Chinese word for superpower (超级大国, chāojí dàguó), and it is distinct from China’s established pattern of sector-by-sector qiángguó slogans that WLQG fits into. One could argue that building on this pattern of qiángguó slogans specifically signals to a Chinese audience a connotation very different from the Cold War game of superpowers. Especially if the goal is to capture that lineage and parallelism for an English-reading audience, superpower is not ideal, because it might not be the right term to apply to each other domain in which qiángguó slogans have appeared. Some uses of the phrase have implied that WLQG status is not so rarified as “superpower” might imply. For instance, a 2016 commentary called for accelerated technological development so as to combat “invasion by Western WLQGs such as the United States (美国等西方网络强国)” in the ideological sphere. Cyber superpower will also not fit grammatically in the relatively rare cases where WLQG carries the meaning of “strengthening the country through cyber,” rather than as a status or goal that a country might obtain. “Cyber great power” as an alternative. Though “cyber superpower” may better capture WLQG’s connotation of rising to compete with the United States, “cyber great power” is perhaps the best alternative translation if certain connotations of superpower do not fit the context. “Great power” captures the connotation of an exceptional level of international leadership and influence but does not carry the all of “superpower’s” Cold War connotations of competing blocs backed by nuclear deterrence. It fits well the contexts where official rhetoric speaks of transforming China from a 网络大国 (wǎngluò dàguó, i.e. “major cyber power/country”) into a WLQG (here, “cyber great power”). But a “great power” may not capture the full force of the ambition behind China’s WLQG rhetoric; at various times, historians have spoken of several great powers at once, whereas superpower status has been more exclusive. China’s digital technology manufacturing base already easily qualifies it as one of the major global actors in ICTs, so it would be reasonable to say China already possesses, rather than aspires to, “cyber great power” status. A note about “cyber.” There are good reasons to avoid the term “cyber” in writing where clarity is at a premium. For one, some readers read “cyber” and think “cybersecurity,” while others might think more broadly of “cyberspace.” It may refer to the “cyber domain” in a military sense, or simply any combination of networked ICTs. 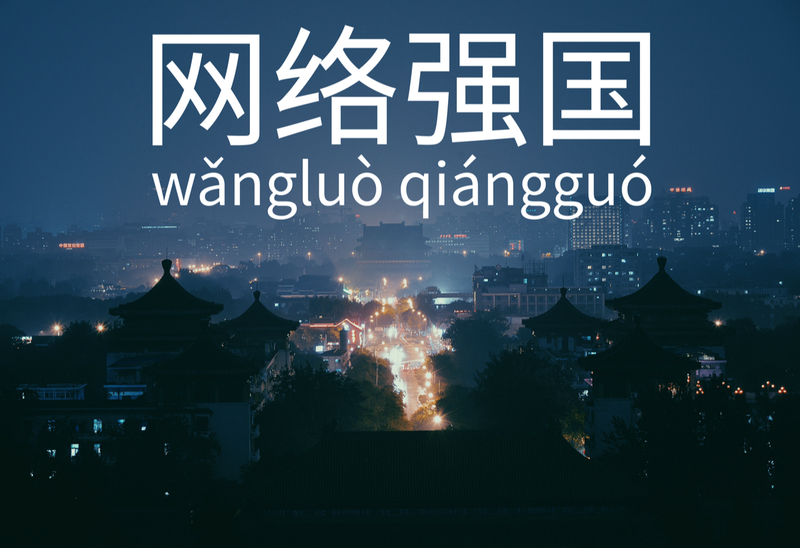 In WLQG, the term we translate as cyber (网络, wǎngluò) literally means “network,” but its connotations are just as vague as “cyber.” It could refer to the Internet, to cyberspace, to the cyber domain, to Internet governance, or to any other combination of networked technology. For once, the vagueness of “cyber” fits snugly alongside the vagueness of wǎngluò, and so we adopt it in all contexts. Still, like “cyber,” wǎngluò carries different connotations in different contexts, so WLQG holds further potential to do the same. The case against literal translation. Why, one might ask, do we in general avoid a very literal translation of the phrase, for instance “strong cyber country” or (even more direct) “strong network country”? The answer lies in connecting the slogan to the context in which it is used and the goals and strategies it labels. Chinese officials are not speaking simply of creating national strength in online technology; rather, they’re outlining a vision in which China is a major powerhouse on par with any global competitor. “Strong cyber country” just doesn’t capture that ambition. A WLQG strategy. The term WLQG is often invoked in combination with the notion of strategy. Common phrasings include “the strategic objective of building a WLQG” (建设网络强国战略目标) and “WLQG strategic thought” (网络强国战略思想). Upgrading to qiángguó status. When the Central Leading Group for Cybersecurity and Informatization was established in 2014, its role was explicitly to transform China from a “major cyber country” (网络大国, wǎngluò dàguó) into a cyber qiángguó. In other words, the diagnosis the central leadership made was that China might be impressive in terms of scale, particularly the number of network users, but it lacked severely in a number of qualitative indicators. Lacking its own technical capabilities, China relied on foreign technologies, and its presence in global Internet governance and digital economy development was limited. WLQG status meant gaining greater autonomy in technological capabilities and greater influence in global governance. Tracking the competition. While technological self-sufficiency may be a specific part of the goal implied in WLQG rhetoric, another implication is a rise to comparable status with the United States or world leaders in any specific area of digital technology. This strong implication of competing to stand at the forefront implies the specific goals of any policy are likely to shift as global competitors make gains or losses. WLQG is sure to remain relevant in rhetoric and as a unifying banner for consequential strategies and initiatives for years to come, and its meanings may also shift. DigiChina will thus continue to follow its usages and may update this Lexicon post from time to time.